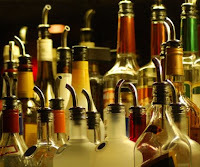 In Stocking Your Bar – Part 1, I helped you get started on stocking your bar. In this post I’ll continue by discussing Bourbon, Tequila, Brandy, Whiskey and a selection of liqueurs. Remember, all of these spirits are available across a broad range of price and quality. For depression era entertaining, you should know how much you can afford to spend and look for the best value within your budget. You may want to spend more on your favorite varieties and go budget on those you don’t use much. Use the web as an information source to compare brands, but be skeptical and look for multiple opinions. Try to determine if you’re paying for a difference in quality and taste, or just for a brand name. Try to find results of independent, blind taste tests. Be sure to consult Wikipedia if you would like to learn more about the history and manufacture of these products. Tequila has always been rumored to not cause hangovers. In recent years, most of the incidents where I feared I might end up with a hangover involved Margaritas. Although I never quite had a hangover, I sometimes “felt a little off,” perhaps due to heavy consumption of Triple Sec? Of the five types, cheap Blanco (or Plata) tequila usually has a harsher taste, so I usually go gold (for everyday) or have a good Plata or higher (like Milagro®) for special occasions. I don’t drink much straight tequila (you should try a Reposado for that), so I stock some Sauza® Gold or Jose Cuervo® Especial. There are a lot of more expensive tequilas available, and I’ll invest in them when I feel like treating myself. You can taste the difference, even in Margaritas, so you might want to have a party to do side-by-side tastes tests some Saturday night to decide which one to stock. Be sure your tequila is “hecho in Mexico,” otherwise it may be much more conducive to hangovers. Brandy is most often made from distilled grapes, and is available in many styles, some with regional names (Cognac), and many different ages that roughly correspond to quality. Many of the brandies made from other fruits are called something else (e.g. Calvados, Kirschwasser, Slivovitz), but even they are sometimes called brandy. I won’t, however, try to cover them here. For cocktails, I’m currently mixing E&J® VSOP, although I have used less expensive brandies with acceptable results. For sipping, I usually go with a cognac like Hennessy® VS or Courvoisier® VS, leaving the more expensive varieties to those that can afford them. Whiskey comes in a stunning number of types (American, Canadian, Irish and Scotch, to name a few) that are distilled from different types of grain mash (such as wheat, rye, barley) and (usually) aged in oak. Quality depends on both the distillation process and the aging process. For your basic bar, I recommend a bottle of Canadian Club® for a good, basic whiskey, although there is room to move down in price and still get a decent product. I’m only an occasional Scotch drinker, so if you’re not either, but want to have a bottle around for those that are “just in case”, I would go with Dewar’s® White Label, which is a good basic Scotch. Bourbon is technically a subset of whiskey. Made mostly from corn, it has enough of a distinctive taste to be mentioned separately. I use it frequently in cocktails and like to pour Jim Beam® Black Label (I stock up when it’s on sale), but there are certainly many other Bourbons good enough for mixing in cocktails at a lower price point (Jim Beam® white label for example). For sipping, Maker’s Mark® comes to mind, but better consult a Bourbon expert. Tennessee whiskey (e.g. Jack Daniels®) is made in a manner similar to Bourbon, diverging in the filtering process.